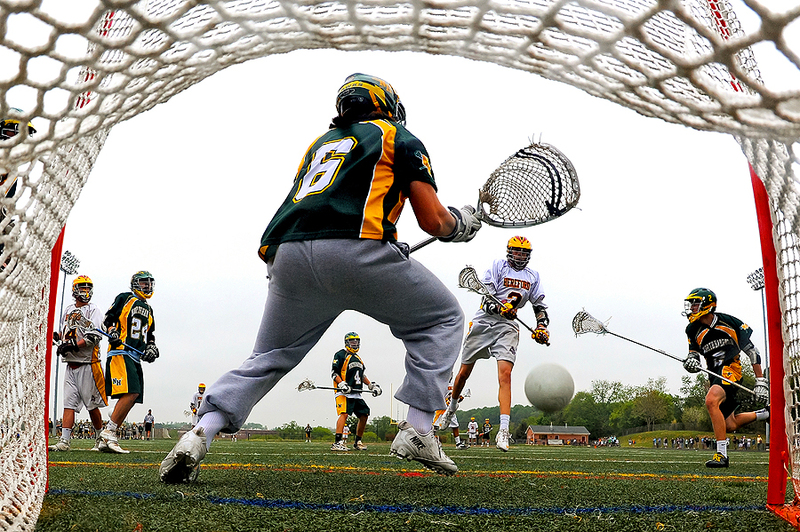 "Goalie Camerson Brosh #6 of the North Harford Hawks cannot make a save on Matt Lewis #3 of the Hereford Bulls as he scores in the second quarter during the MPSSAA 3A-2A North Regional Championship at Hereford High School on May 14, 2014 in Parkton, Maryland." 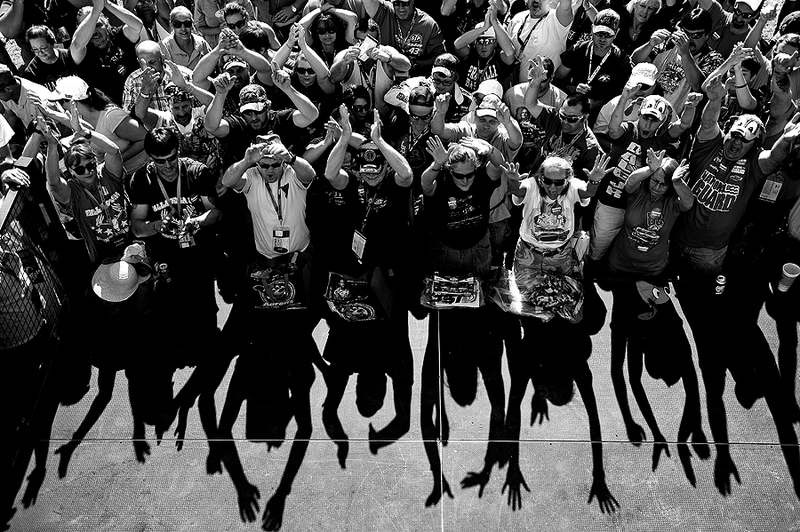 Every year photographers cover the same sports - and trying to find a new vantage point is something we're always seeking. Sometimes they're ideas that no one has ever had and we keep the secret until the day of the game. Other times they're adapations of those that came before us. Covering a handful of lacrosse games this year, I asked my fellow teammate if I could borrow his custom-made lacrosse goal box. Having never played with one, I decided to give it a test run during a high school lacrosse game before placing inside of a goal during a major contest. It was a bit nerve-racking as the box doesn't come with instructions. After configuring the way I thought would be best (it wasn't and I tweaked it the second and third go around), I went through the proper channels in getting it approved and making sure it was safe for the players, too. After blessings from everyone involved, I found the cleanest background on the field, installed, focused, and hoped for the best. Despite it getting vetoed minutes before face-off in other games following this, I think it's an awesome angle and boosted my confidence on trying this angle with other goal sports. 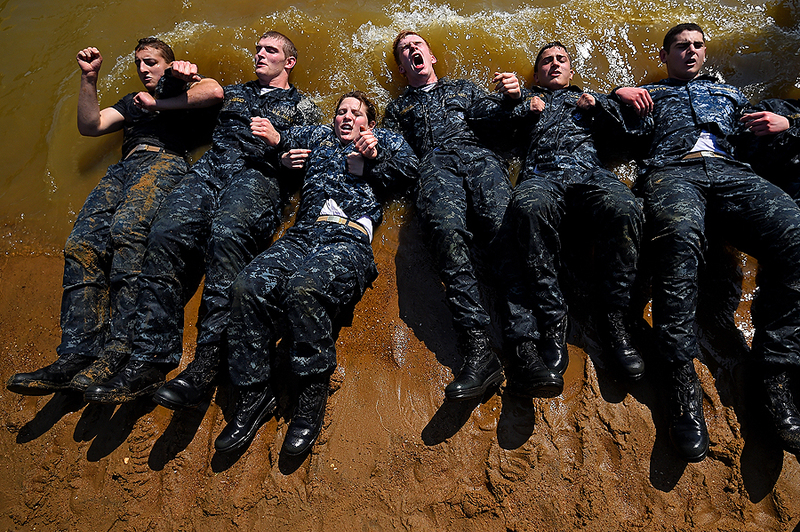 "Members of the United States Naval Academy freshman class do sit-ups at the wet and sandy station during the annual Sea Trials training exercise at the U.S. Naval Academy on May 13, 2014 in Annapolis, Maryland. For 14 hours, the United States Naval Academy freshman class, also known as Plebes, worked as a team to complete many grueling physical and mental challenges that help prepare them for real-world experiences and reinforce leadership, bonds, trust, and teamwork." When most think of sport, they think of some sort of classic game including a ball. But at the core, sport by definition is more about teamwork, training and unity. Beyond competitive physical activity, there is also a mental aspect to sport, which the freshman United States Naval Academy are familiar with. Also known as Plebes, the annual Sea Trials training exercise at the U.S. Naval Academy is a prime example that the freshman class are not only a team within their own company, but universally as midshipmen. Covering the Sea Trials for Getty Images, I shot for a couple hours, of the 14 hours, that these midshipmen worked as together to complete many grueling competitive physical and mental challenges that help reinforce: leadership, bonds, trust, and teamwork. These governed challenges, which there is no score, or even winner determined, test their skills and help achieve a common goal that aims at improving their physical and cognitive abilities. Their determination to be the best shines through as they try acheive greatness and standout from those that came before them. Of the challenges, they endured: a two-mile regimental run, ground fights, water tactics, aquatics challenges, and survival skills, amongst many others. Pain, sweat and suffering only create bonds that at the end of the grueling day bring the plebes together as one team. "Torii Hunter #48 of the Detroit Tigers is hit by a pitch by pitcher Bud Norris #25 of the Baltimore Orioles (not pictured) in the eighth inning at Oriole Park at Camden Yards on May 12, 2014 in Baltimore, Maryland. The Detroit Tigers won, 4-1." Shooting batters during baseball games can very difficult. With the ball being thrown more than 90mph, timing the ball in combination with a swinging bat for the perfect picture is rather difficult. Not to mention, you may be focusing on the players in the infield, or the pitcher, and totally miss a big hit. It's a gamble where to focus your attention at times. During the game between the Detroit Tigers and the Baltimore Orioles, I was betting on the wrong players at the wrong times. I missed two diving plays that I'd typically be focused on when I was instead was shooting the batter. In other words, nothing was going my way. And that's life. Sometimes you're not in the right spot or even focusing on the right place at the right time. It is what it is. 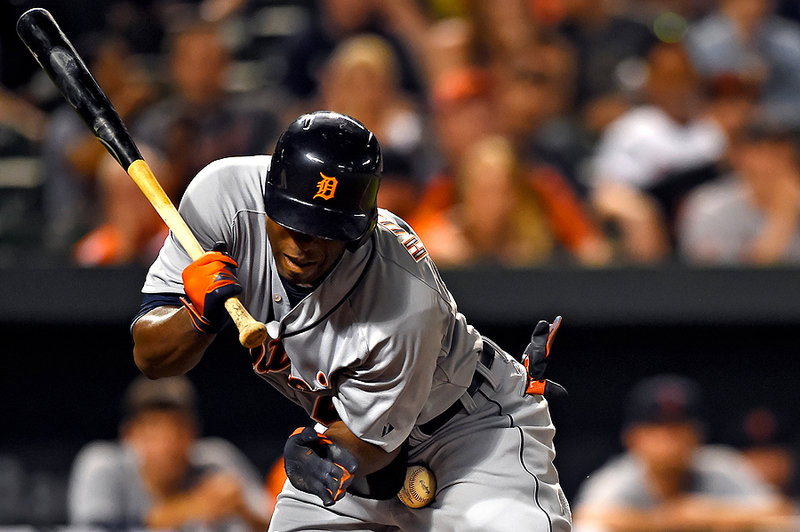 But late in the game, Torii Hunter of the Detroit Tigers was hit by the pitch, and it caused quite the stir, that cleared both benches. No punches were thrown in the end, but it sure did look like that pitch hurt. 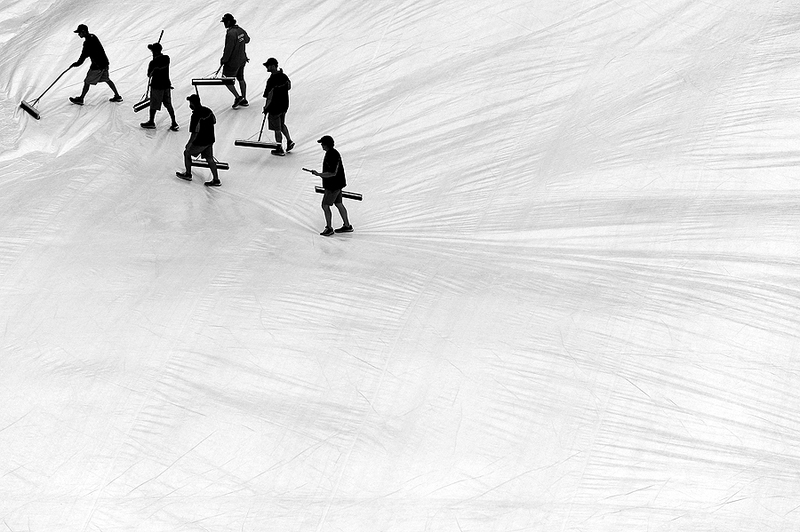 "The Washington Nationals grounds crew pushes water off of the rain tarp before the Los Angeles Dodgers play the Washington Nationals at Nationals Park on May 7, 2014 in Washington, DC." When it comes to sports, most want to see the images of the big play. While I am no different, and also want to see that one incredible picture, I still approach sporting events as a story. There is a beginning, middle and end to all match-ups. There are pictures that need to be shot and shared from each phase despite one picture being able to tell the entire story sometimes. However, of all of those sequences, the first part is the most ignored. It's usually a period of time for everyone involved to prepare. But I am always doing my best to find story-telling moments before the time even begins ticking off of the clock. Recently, before the Washington Nationals played the Los Angeles Dodges, instead of enjoying the rain delay catching up on work on my computer, or simply just enjoying some down time, I decided to work the grounds crew cleaning the tarp. It isn't an important image at the end of the day, but at that moment, it was needed to tell the current story. "Starting pitcher James Shields #33 of the Kansas City Royals works batter Nick Markakis #21 of the Baltimore Orioles in the four inning at Oriole Park at Camden Yards on April 27, 2014 in Baltimore, Maryland." Of all the sports I cover, I always bump into friends, family and acquaintances during Baltimore Orioles games. It's the unofficial sport of the summer - and with more than 80 home games played throughout the year - it's difficult not to see someone you know in passing. The first thing most always say is that they're jealous of my access to be field level. But I always remind them that they also have a grand view from their location in the stadium, too. For a couple weeks I've been wanting to prove that point as I had never been into the famous warehouse at Oriole Park at Camden Yards. Of all the games I've covered, I've never once stepped into the warehouse during play. It wasn't until I picked up my season credential earlier this year that I got a peek out window. I was instantly drawn to the view out the window and planned to return when the crowd was filling the stands. 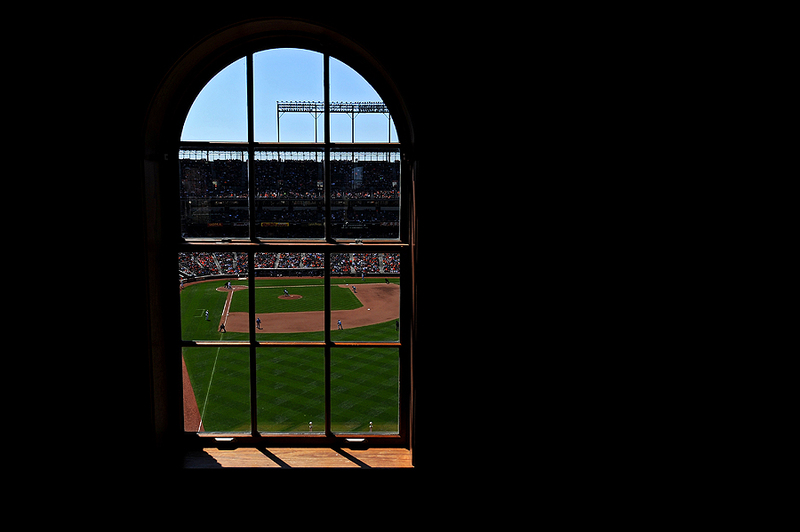 For two innings I shot lots of general views of the ball field, yet at the end of the day, the room with a view was my favorite image of the day. 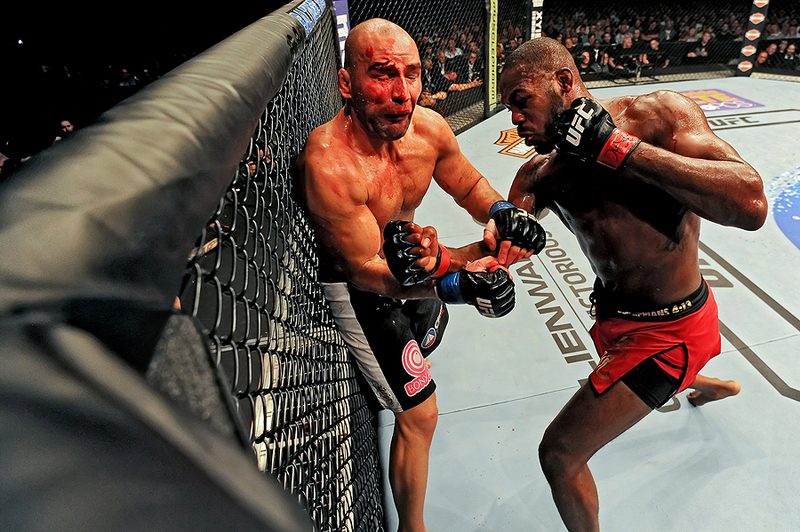 "Jon Jones punches Glover Teixeira in their light heavyweight championship bout during the UFC 172 event at the Baltimore Arena on April 26, 2014 in Baltimore, Maryland." In April, I had the amazing opportunity to document UFC 172 for Getty Images in Baltimore, Md. To preface, I had only seen highlights leading up to the ten bouts I documented ringside. Never had I ordered a fight or seen one in person. After the big events, I'd watch all the highlights to familiarize myself with the sport. In addition, I always followed the photographers that in my mind are legends of shooting the sport. They always made it look easy - and I quickly found out it wasn't. Going into the night I was nervous - as I had no idea what to expect actually photographing these unbelievable athletes. Every kick, punch and ground move could easily result in the end of the match and the first fight was a real wake up call. But as the night went on, I found my rhythm and shot a lot of frames to help not miss a potential knock out. I had a lot of fun and learned a lot. I'm already looking forward to the next fight.